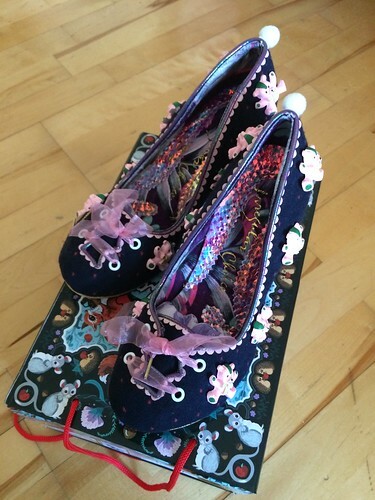 t*rexes and tiaras: Sunday Shoes 084..
Irregular Choice just keep on coming up with wonderful new styles, lately. This season has been particularly exciting as they've brought back the rather iconic inverted heel, as previously seen on Prom Princess and various others of earlier years. I'm a real fan of the shape of the heel and can confirm that despite what people may think, it's really comfortable and sturdy. And what about the design? Well. Where do I start? 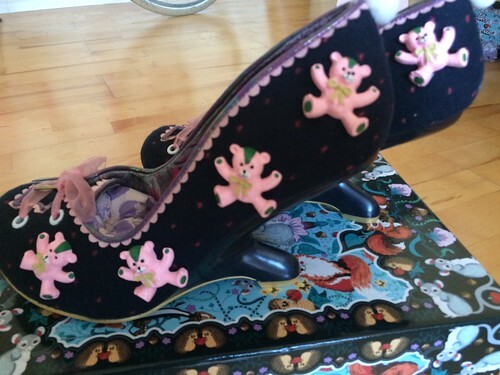 I guess the most obvious and eye-catching part is the teddy bear embellishment to the sides of the shoes. 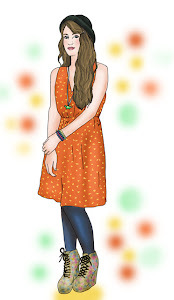 Sturdily attached in cheerful colours. But what about all of the other, slightly more subtle details? Like the tiny red polka dots on the background material, and the cute pink scalloped leather trim around the top. More of the organza ribbon from recent styles finishes off the fronts of these shoes, but again this is a pair where I think it works nicely. In fact, the only part I'm not entirely convinced about is the little white pom pom on the back of each shoe. It reminds me of a little rabbit tail and just, to me, doesn't seem to fit with the rest. What do you think of Izzy Bear? 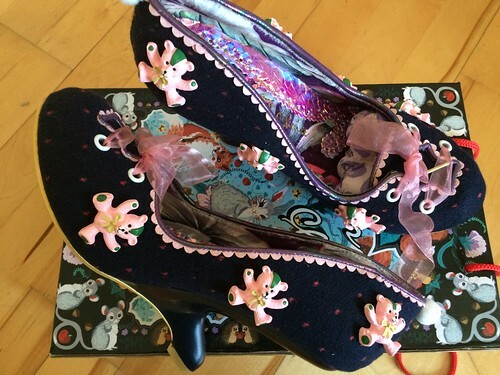 Any of the other Irregular Choice heels catching your eye lately? I'm a big fan of the kitschy teddy bears. I know they're comfortable but I'm not sure i could trust myself to walk in them properly! I was really pleased to win a pair of the green suede ICs with a jewelled frog on eBay recently. I've admired both yours and Odd Socks Alex's and have been watching ebay for ages. I can't wait to wear them. 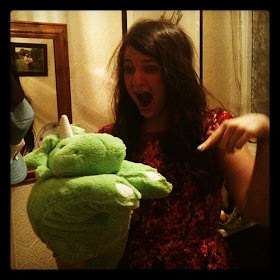 Oh, that's exciting - those green frog ones are a classic and the ankle strap makes them look so elegant and dainty.